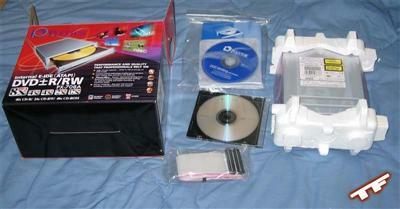 I'd like to start off this review by thanking the people at Plextor for providing this product for us to review. The front of the drive has everything on it that you would expect to find: the eject button, a manual eject hole, a multi-color LED to show drive status, a volume control knob, and a headphone jack. There's also a Plextor logo on the left side of the tray, but the glare from the flash of my camera makes that nearly impossible to see in this picture. The drive came with Plextor's version 1.04 firmware on it, but I upgraded it to version 1.06 before running any tests to fix any bugs that have been worked out since version 1.04 of the firmware. This test went just as expected, with a constant write speed of 4X the entire time. Here we see the writing starts off at 6X and then jumps to 8X pretty quickly once the drive gets far enough out in the disc to be able to burn at 8X. Here we see that the Lite-On drive, by default, will write quite a bit faster than the Plextor drive. This is to be expected since the Lite-On drive can write CD-Rs at 48X, while the Plextor drive can only write them at 40X. When I limit the write speed of the Lite-On drive to 40X, as seen in the last picture, the difference in write time between it and the Plextor drive is only four seconds, not enough to really matter. Here we see the drives performing almost equally, with the Lite-On being just a tiny bit faster. The only test where there's a big difference here is the eject/load test, where the Lite-On drive is able to load and recognize the disc about 14 seconds faster than the Plextor drive. In this test we see results that are similar to what we saw in the DVD-R read speed test. The speed difference between the drives is minimal, with the only major difference being that the Lite-On drive is able to load and recognize a disc quite a bit faster than the Plextor drive, which parallels the results seen in the DVD-R reading speeds. As you'll notice here, the Plextor drive is limited to 2X read speeds on DVD movies. This is a big downside to this drive for anyone who is planning on using this drive to backup lots of movies and doesn't have another DVD drive for reading the DVDs with. There are firmware hacks out there that claim to remove this 2X limit, but they are not supported by Plextor and will void the warranty on your drive if you use them. Here we see the 2X limit on the Plextor drive again. We also see the Lite-On drive performing quite a bit slower than it did in the single-layer test, and this is because reading of dual-layer DVDs is generally a lot slower than reading of single-layer DVDs. Each of the drives ran into errors on the disc that required them to slow down for a moment to read the data, although these errors appeared in different places on the different drives. Overall, we can see the Lite-On drive performing quite a bit faster than the Plextor drive. Here we see the the Lite-On drive once again performing faster than the Plextor drive. So, what do all these numbers and graphs mean? Well, if you're planning on getting this drive, you might consider getting a separate drive for reading your optical media. While the PX-708A can hold its own in DVD-R and DVD+R reading tests, it is bested by the Lite-On 48161H combo drive in CD-R and CD-ROM reading. 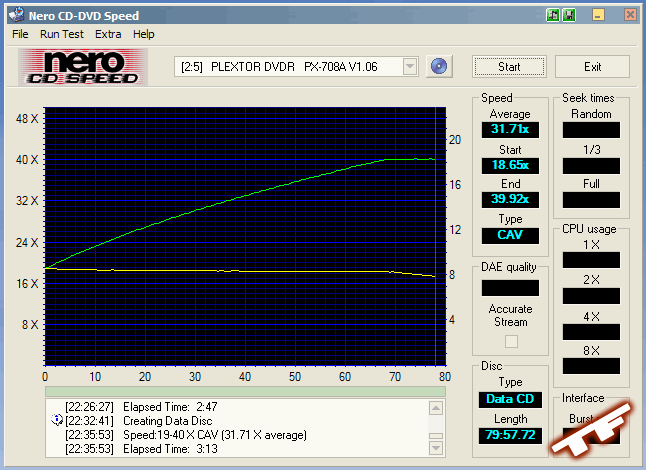 When it comes to ripping DVDs for backup purposes, most drives out there will be faster than the Plextor PX-708A due to its 2X rip-speed limitation. Be aware that many other manufacturers of DVD writers put similar rip-speed limitations on their drives to discourage illegal copying of movies, so Plextor is not alone here. 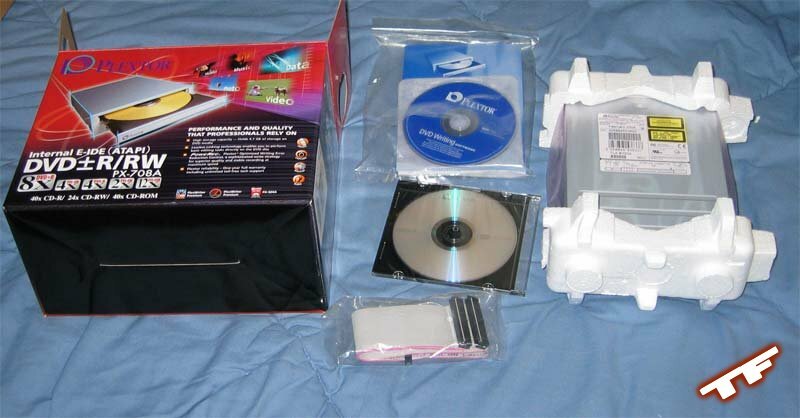 However, most DVD-ROM drives do not have these limitations, so if you're going to be backing up a lot of DVDs with this drive, you might consider spending the $30 or so it would cost to get a separate DVD-ROM drive if you do not already have one. Also remember that there are firmware hacks out there to remove this speed limitation from the Plextor drive, but these will void your warranty and are not supported by Plextor. As we all know, speed is not the only factor to take into consideration when looking at a piece of hardware. What about reliability? Well, to test reliability, I've been using this drive as my main DVD burner for about a month. I have burned about 25 pieces of assorted DVD-R and DVD+R media with it. And have yet to burn a coaster or run into any problems with this drive, even with cheap media. This drive has taken every disc I've thrown at it and worked beautifully with it without any hassle, and that's a huge plus. If you're looking for a good dual-format DVD burner right now, then the Plextor PX-708A is an excellent choice, especially since the price of this drive is getting pushed down due to the release of 12X drives. While the PX-708A might not be able to read all media quite as fast as some competitor's products, it is a very fast-writing drive that seems as though it will work with just about any media out there without any fuss. Overall, this is a great drive. However, if you're hesitant to buy a DVD burner right now, you might want to wait a little bit longer for dual-format burners to come out.